I slapped my son in public and earned the condemnation of a neighborhood Peruvian for being abusive. Could I have been charged for child abuse? An open letter to the guy I slapped yesterday explaining why I slapped him. 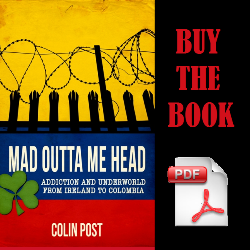 Announcing the publication of Mad Outta Me Head: Addiction and Underworld from Ireland to Colombia. Spider, a fellow inmate at La Picota prison in Bogota, kills another inmate. As told by Kendall in Smuggler’s Diary: Cocaine Karma. In his autobiography, Smuggler’s Diary, Kendall describes the first stabbing he witnessed at the Villanueva Prison in Cali, Colombia. A look at the 2013 murder of Canadian expat, Brad Deering, in San Jose, Costa Rica. Telling the story of a gringo who was stabbed in Bogota’s Parque de los Periodistas in an attempted robbery. Pictures of La Punta de Callao in Lima, including Colonial Callao, Real Felipe Fortaleza, Chucuito, Plaza San Martin, Plaza Matriz, and Plaza Galvez. Profile of Lewis Charles Cornelius, who is serving time in Huaraz, Peru for possession of cocaine.